Unsafe speed causes minor injury traffic collision occurred on the 13000 block of California Street. On Wednesday, October 10, 2018 at 1:37 p.m. the driver was traveling north on California Street in his 1999 Dodge Ram 2500 pickup. 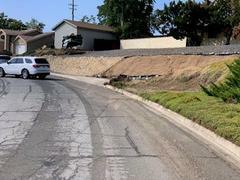 As he navigated a sweeping turn in the roadway, the vehicle began to slide, exited the roadway and struck a mailbox and retaining wall. 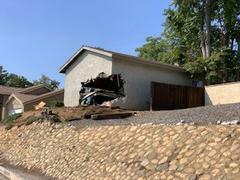 The collision with the sloped retaining wall caused the truck to go airborne and collide into the garage of a residence. 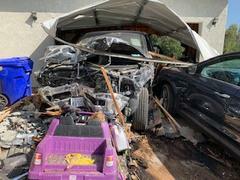 The truck went into the garage, struck two vehicles parked in the garage, and came out through the closed garage door. The driver and one passenger were not injured. The other passenger received a minor injury and was taken to an area hospital for treatment. Alcohol and drugs were not a factor in the collision and the investigation determined the primary collision factor was excessive / unsafe speed.